Stacy Corbin caught his first fish in Arizona at the age of three. According to his mom, he proudly dragged his prize sucker around in the dirt for some time. He began fly-fishing with his Dad at the age of six, and most fish since have met a better fate than that poor sucker. Stacy has fished much of western North America, and has developed a passion for sharing the art of fly-fishing. 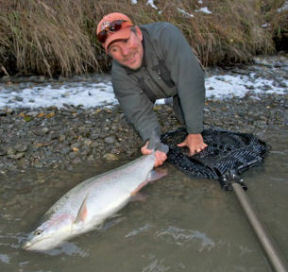 Stacy moved to Seward in 1981 and began taking in the fishing opportunities of South Central Alaska. The Kenai River became his favorite stomping ground. After graduating with a degree in Marketing from Washington State in 1993, Stacy started Grand Tour and Russian River Fly Fishers. Now, when he is not promoting Alaskan tourism, playing in a band, fly-fishing off a beach in Baja, or wogging silvers in the salt, he can be found rowing a boat and chasing trout on the Upper Kenai. He is an avid outdoorsman and enjoys biking, hiking, camping, and of course fishing. Stacy loves guiding and will eagerly share his knowledge and techniques. Stacy has a wonderful lakeside property in Cooper Landing. The house we rent as our "Mystic Lodge" was built by Stacy and his father. It has become very popular with our guests. 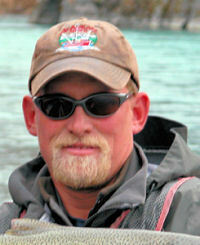 Stacy is always ready to help make your Kenai River guide trip a fantastic fly fishing experience. At the age of two, I captured my first Bluegill in Southern Michigan. Since then, I have never stopped looking into waters for fish. I spent my early years fishing in Wisconsin and Canada for both warm and coldwater species. It was a toss up between trout and salmon or the mighty muskie, until I graduated from college. Then I was drawn north to wild native fish in the largely pristine ecosystems of Alaska. Guiding anglers and spending the fishing season outdoors in Alaska has been my passion since 1989. Years of guiding have taught me the techniques necessary to make your fishing trip experience educational and productive. I can honestly say that I am one of the first dedicated fly fishing drift boat guides to work the Kenai River. In 2006, I was honored with induction into the Freshwater Fishing Hall of Fame as a Legendary Guide. You can expect top-notch service and 100% effort on every trip. I love sharing the Kenai River and surrounding waters with my guests. Having fun and making your angling dreams come true is my goal. Mystic Waters welcomes both experienced and novice anglers. I leaned to fish with conventional tackle, but soon developed into a passionate fly-fisherman. I can customize your fishing trip whether your experience is with fly-fishing or not. If you are interested in learning to fly-fish, do not be intimidated. It is fun and you can learn to catch fish in a very short time. Teaching anglers something new and sharing in their success is one of a guide’s great rewards. I am currently managing the fly shop for North 40 Outfitters in Great Falls Montana and guiding part time for various outfitters on the Missouri River. My period of full season guiding in Alaska has come to an end (at least for now), but not my passion for fishing in Alaska, Montana and beyond. I plan to host a trip or two back to Alaska each fishing season and to other fishy destinations around the globe. In the event that we have no spaces available, we will do our best to place you with one of our top Kenai River guide associates.